This conversation happened during what was intended to be the apex of a relaxing summer vacation - a kayak trip with a great deal of paddling, bathing, lazing, sun and beer. But that was not to be. We had planned this trip well ahead of time. 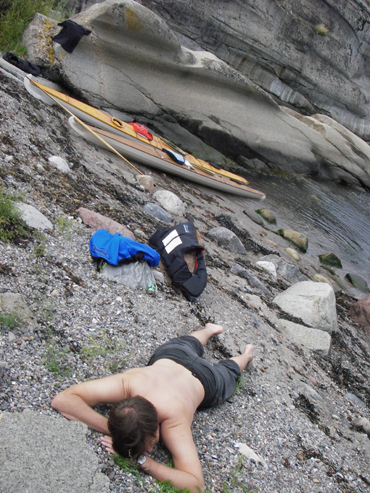 Our goal was as much paddling and as little driving as possible, so we settled on the Vestfold coast in Southeastern Norway. We had envisioned flat, quiet seas and long crossings on open water. Peaceful evenings lounging on polished rock at the water's edge - with good food and wine. We had planned to leave in late July to maximize our chances of good weather, and thought that this plan couldn't possibly fail. We were two, which we believed was an ideal number for such an extended trip, if we could stand one another's company. It was my friend Alexander and I, each with our own homemade skin-and-frame baidarka. The weather forecast prior to our trip had indicated fair conditions and gentle winds. But the sea breezes on the coast are almost unavoidable, and we thought we would do as we had done before, paddle during the morning and evening, making good time when there was little wind, and take a break and slack off around. We found a good harbor to set out from, parked, packed our kayaks, and set off. We hadn't gotten far before we realized that the wind was stronger than the forecast had indicated. The wind was also turning more and more straight against us in spite of the forecast. We struggled a while against fairly high seas and a fresh breeze for a few hours. Progress was slow, and we decided to take a break and hope the wind would quiet down. We found a nice island with sun and shelter from the wind where we could eat and take a nap. Alex turned 40 a few years ago, and I'm approaching, so Alex is informally tutoring me about the niceties of adult life. One of the better things he's taught me so far is the afternoon nap! Even for a youth like me it was welcome. So far we'd paddled from Nøtterøy to Stauper in the Mefjord. Stauper is a wonderful place, but fairly far out of the way and thoroughly exposed to the elements. We had to face the fact that the wind wasn't going to quiet, and we had to paddle on. 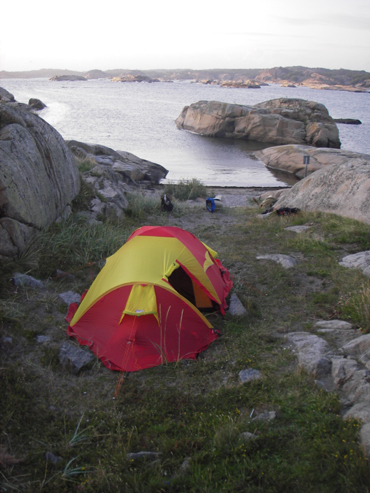 Our original plan was to paddle southwards along the coast of Vestfold in the direction of Larvik. 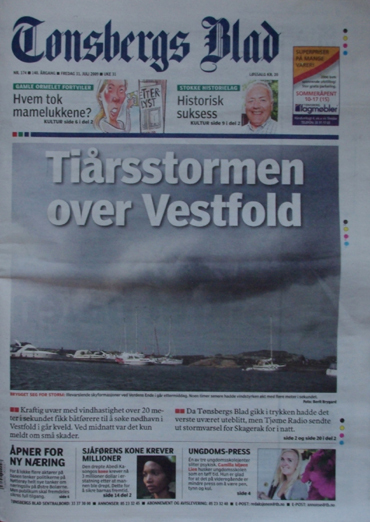 But with a southerly strong breeze it was unappealing to fight against the growing waves that came crashing towards us, not to mention rounding the feared cape "Tønsberg Tønne"! 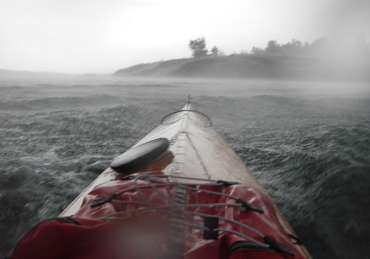 We thought it could be a bit too wild given our full kayaks and our desire to remain dry. But the weather was good, and we enjoyed the evening with our backs towards the camp and our faces towards the sunset - beautiful nonetheless! We agreed to start early the next day. Partly to get some paddling done during the daylight hours in case the wind were to build up again, and partly to get around Verdens Ende in somewhat calm weather. We did as planned and got up around 6AM. We were on the water by 7:30. After we had paddled for nearly half an hour, Alex discovered that the map was gone! Alex had dabbled in orienteering in his youth, and appreciates having a map and compass to hand, and dislikes being without. Had it been blown away, or had we left it at the campsite? We thought of several ways to check - paddle back, go ashore and run, take a taxi and I don't know what. In the end we decided to ignore the issue and paddled on. The coast is straightforward and we know the area fairly well, so we took the chance. Suddenly we realized that the dark horizon was approaching rapidly. After this realization we had just enough time to put on hoods and shut all openings on our clothes and kayaks - there was no time to waste. Wham! As though poured out of a bucket, the wind, rain, thunder and lightning descended on us. I said rain - but this wasn't what we'd normally call rain. 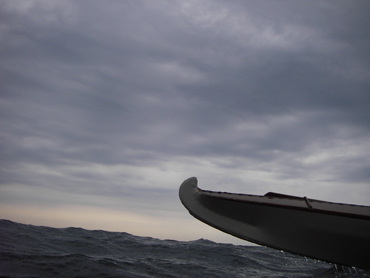 Torrents poured down on us, and the seas were boiling. The world had suddenly become an inferno of wind and water, set to a soundtrack of tremendous thunder and illuminated by oversized lightning bolts that ripped apart the sky. WOW! There was no time to be afraid, only to hang on as we were blown along at high speeds. I've never seen anything like it - surfing wind waves of this type and size? It was hard to communicate under these conditions, but after some shouting and gesturing we agreed to seek shelter behind a small island that we were rapidly approaching. We took a break there and discussed our options, which had decidedly diminished since our last stop. Spend the night on the island? Making camp in such weather wasn't exactly an appealing prospect. Paddle onwards? Not much fun either. In spite of the unbelievable weather, we were actually having a fairly good time. 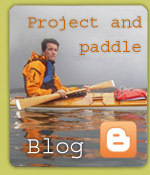 We were sitting dry and warm in our kayaks - no way were we getting out of those! We drank a cup of tea and shared a bar of milk chocolate (with almonds! - highly recommended). Meanwhile the storm came to an end around us, and after a few minutes' excitement the rain slackened and the thunder and lightning drifted northwards. 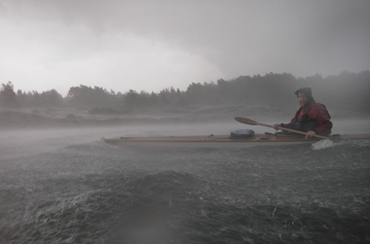 There was a lot of wind and a little rain left - we decided to paddle onwards. We pined for the map, because we had no way of knowing which islands were around us. In the end we decided to paddle with the wind (we'd had enough tribulations by now) and stop at the first habitable island we came to. We let ourselves out of our little emergency harbor, and drifted northwards. After drifting for half an hour we encountered a forested little island with a small beach sheltered from the wind. I would have liked to keep looking for a specific island I know, which I thought was nearby, but with poor visibility, no map and bad weather we let it be. The island we stopped at was actually top-notch. 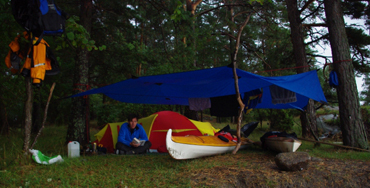 We rigged a tarpaulin between a few large trees, cleared the ground under it, pitched the tent with the opening under the tarp and pulled up the kayaks under the tarp. 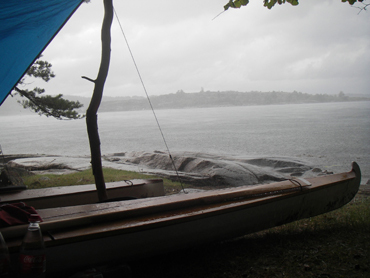 The rain had strengthened in the meantime, and unpacking kayaks unprotected in such weather didn't appeal to us. We, however, had kayaks, our tent, and everything else under cover, so we had to celebrate with a little shot of Calvados. It's easier to have a good time when you're dry, warm and comfortably full, so after changing clothes and rolling out our sleeping bags and the other things we wanted, we made dinner fit for a king. The map showed up again - it had been in the inner tent! We had some more shots, some beer, and enjoyed ourselves with a view of rain and storm, sea and sky.The wind changed during the evening, and blew right into our camp, eventually with whole gale strength. We tied the tent and tarp down with more guy lines, and went to sleep free from concern. The wind had settled the next morning. There were weak swells on the sea, but we had no difficulties. The sun was peeking out, and we could continue paddling. It was the calm after the storm; no people or boats in sight. We later discovered that most of them had sought refuge in emergency harbors, once we could read about the storm and other events of the night in the local newspaper. On the last leg of the trip we had opportunities to paddle and bathe, and in so doing fulfilled all our wishes for the trip, even though it had turned out to be a very unusual trip, which we think we'll never forget.